Looking For an Excuse to go Fishing? Looking for excuses to plan a fishing trip? Look no further, we got you covered! 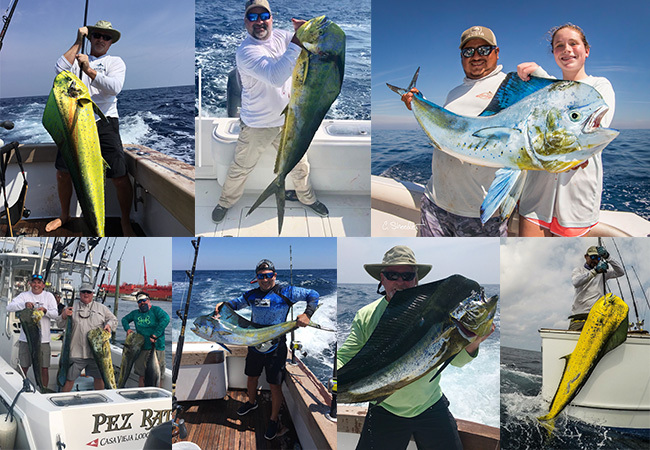 Celebrate the long Memorial Day Weekend fishing on a beautifully maintained sport fisher, lake-like seas, 88 degree weather, with loads of sailfish and more chances at HUGE mahi mahi, tuna, and blue marlin! You could also gift that special woman in your life a relaxing fishing trip for Mother’s Day on May 14, and we will support the cause with a complimentary in-room massage at Casa Vieja Lodge. Let’s talk about the ideal graduation gift that you’re children surely will never forget. Raising 12-15 billfish per boat per day, will set your parental standards even higher than you thought possible. It’s like Christmas for Dads at our 2018 Father’s Day Fishing Frenzy June 15-17th. We have TWO boats available, we just need you to decide if your team will be a part of the tournament! A fancy Father’s Day brunch requires a shirt and shoes, fishing doesn’t! Looking for another reason? Surprise proposal, mission trip, medical trip, cruise stop, business retreat, not enough fish in your backyard? Chances are good we have helped other anglers like you validate their reason to go fishing! We will gladly accept all excuses to help plan your next trip to Casa Vieja Lodge it’s something we truly enjoy! In mid-March the waters warmed up and more mahi-mahi began coming into the Guatemalan “pocket”. Spawning season for the mahi-mahi or dorado or dolphin fish, happens around late April through May, which have the blue marlin trailing close behind. Over the past month, our captains have seen some of the largest mahi mahi they have seen in past years in the 25-55lb range. The boost in mahi mahi catches have made for some very happy anglers. A tough fight pays off when you see the colorful spots of yellow, gold, blue, and green flash before you. Soon after, our mate prepares a hot mahi mahi sandwich aboard the boat and victory is yours. However, the pressure is on YOU to reel one in before lunch time! The Canadian geese have returned home from Guatemala, absolutely fascinated with their experience on the Pacific Coast. 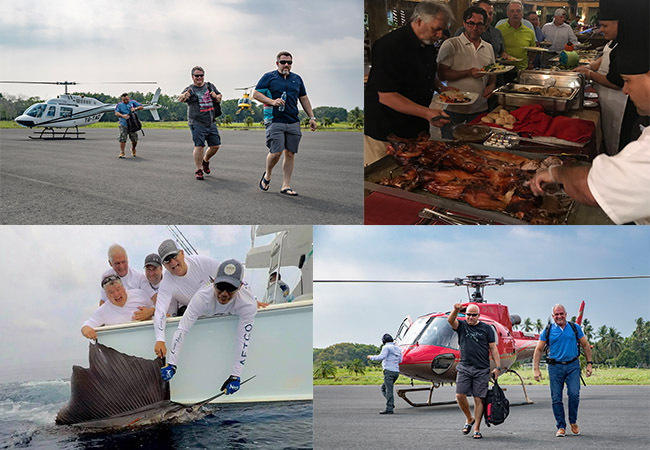 Beginning their journey by flying into the local airport of San Jose on six helicopters gave these anglers the unique opportunity to tour the volcanoes, Antigua, and the marina by air prior to arriving. The group of 24 Canadian anglers made their way south to Casa Vieja Lodge for some warm weather, fantastic fishing, and ice cold drinks! For the majority of this group it was their virgin voyage to Guatemala and billfishing! Our Captains spoke with them nightly and helped teach the age-old tricks of reeling in a big one! The group totaled with 371 sailfish raises, 291 sailfish bites, 149 sailfish releases, 23 tuna, AND 120 mahi-mahi. On their day of departure they got the flock out of there via helicopters to Guatemala City. If you are interested in upgrading to a helicopter tour please inquire with our Miami Office, it’s definitely an adventure. Merci beaucoup a nos nouveaux amis. Nous vous verrons l’année prochaine! Our Pacific Coast is beautiful and alive. A day on the water makes for multiple national geographic moments with pods of spinner dolphins, large green sea turtles, bait balls of sardines, and frigate birds causing trouble. A day spent on Guatemalan waters is truly a phenomenal experience. Below are a few fishing highlights and you can check out our daily fishing report HERE. 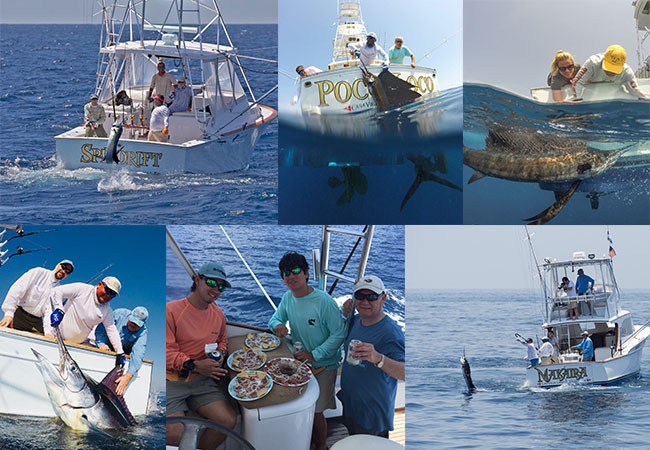 April 1st-5th & 14th-15th, the Pez Raton (35′ Contender) with Capt. Franz Hoffman, had 144 raises, 105 bites, and 52 sailfish releases. They also had 5 marlin raises, 2 marlin bites, 26 tuna, 7 mahi-mahi, AND 2 roosterfish. April 1st-17th, the Poco Loco (44′ Kincheloe Nickerson) with Capt. David Salazar, had 359 raises, 312 bites, and 166 sailfish releases. They also had 5 marlin raises, 4 marlin bites, 3 marlin releases (1 striped marlin), 8 tuna, and 36 mahi-mahi. April 1st-17th, the Finest Kind (40’ Whiticar) with Capt. Chris Sheeder, had 337 raises, 245 bites, and 134 sailfish releases. They also had 7 marlin raises, 6 marlin bites, 2 marlin releases (1 striped marlin), 25 tuna, and 22 mahi-mahi! April 1st-18th, the Release (37′ Merritt) with Capt. Chico Alvarenga, had 492 raises, 376 bites, and 204 sailfish releases. They also had 5 marlin raises, 3 marlin bites, 1 marlin release, 19 tuna, and 39 mahi-mahi. April 1st-18th, the Makaira (37’ Rybovich) with Capt. Jason Brice, had 192 raises, 141 bites, and 76 sailfish releases. They also had 2 marlin raises (1 striped marlin) and 30 mahi-mahi. April 11th-16th, the Afinity (39’ Billy Knowles) with Capt. 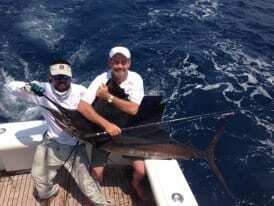 Nico Melendrez, had 139 raises, 96 bites, and 47 sailfish releases. They also had 2 marlin raises, 2 marlin bites, 2 striped marlin releases, 2 tuna, and 25 mahi-mahi! April 13th-17th the El Cadejo (35′ Contender) with Capt. Efron Rizzo, had 111 raises, 76 bites, and 34 sailfish releases. They also had 18 mahi-mahi! 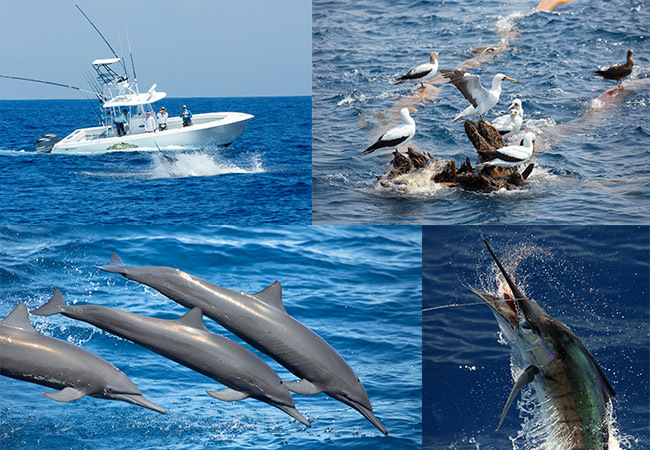 April 15th-17th, the Intensity (37′ Gamefisherman) with Capt. Mike Sheeder, had 137 raises, 94 bites, and 53 sailfish releases. They also had 3 striped marlin raises, 2 tuna, and 14 mahi-mahi!